Tsehaye Debalkew, May 18, 2013, Washington D.C.
Accolades were made and tributes were paid to Ethiopia’s extra-ordinary leader, the late premier Meles Zenawi, for his outstanding contribution to the renaissance of Ethiopia, the enlightenment of the continent of Africa and for his engaging international diplomatic efforts. 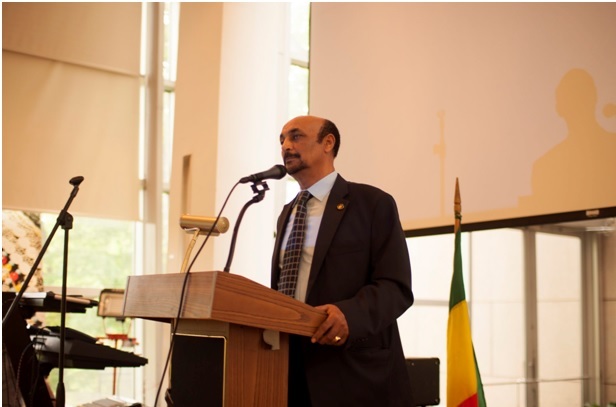 A packed gathering of the Ethiopian Diaspora numbering several hundred paid tribute to Ethiopia’s great leader at a commemorative occasion organized and hosted by the youth drawn from the Greater Washington area at the Chancery of the Ethiopian Embassy in Washington D.C. last Saturday. Dr. Tilahun Beyene who was motioned to the podium by the Chairlady of the organizing Committee, Tigist Gebreselassie began by presenting a moving memory of the late Premier Meles Zenawi beginning from early childhood up to adulthood and beyond by succinctly recalling his talents, qualities, special gifts, his notable power of success and enduring mental capacity. values of PM Meles by stating that they included his astute knowledge, proactive personality, magnanimity, civility, humility , simplicity, his voracious skill of reading and his amazing retention and communications power and spectacular performance recounted that the Premier was at times down to earth humorous. Professor Ephraim Issac from Harvard University began with an aura of intimacy and declared the Late PM Meles by emphasizing his unswerving conviction at building community consensus, trust and his indefatigable belief in reconciliation and his bedrock belief in peace making. He added that the former PM was a capable and a skilled negotiator. Underlining the Premier’s gigantic task that he shouldered in the realization and quintessential precondition of the prevalence of peace as the cornerstone of his core values, the Professor recalled the various missions that he was fortunate enough to undertake during the engaging discourse he happily shared with PM Meles Zenawi. Dr. Mulay T. Yohannes who was the private physician of the late PM, on his part hailed the visionary leader as untiring one who strove to eradicate the evil aegis of poverty and praised the political change that Meles had effected and the economic take-off that his policies had brought about. “But for Meles” he said, “growth had a purpose and was instrumental in transforming the lives of millions of Ethiopians. The personal Doctor of the leader recollected his memories by sharing with the audience a telling narrative about the PM’s farsightedness and selflessness. “When the PM was acutely ill and was being rushed to the airport in Addis for further advanced treatment abroad, Meles pleaded that he was driven through the new Bole road which was then under construction to the utter astonishment of all”. Even at this trying and agonizing time his heart was bleeding to see the light of the day by meticulously following how Ethiopia fared better Dr. Mulay recalled with empathy. Another former acquaintance of PM Meles from the old days in college Ayalew Yimam reminisced the fond memories they jointly shared and described PM Meles “a man of action” and a fiercely independent thinker. He characterized Meles as the embodiment and firm believer in peoples power through the combination of both the estranged nations and nationalities and the urban and rural people who were disenfranchised by the millennia old landed gentry and oligarchy and the military putsch. Professor A. Kadir Nur-Hussen ,from the University of Louisiana, former teacher of Meles during his years of elementary schooling in his native town of Adowa described “Meles was the very best” among his peers . Tigist G. Gebreselassie, the Chairwoman of the proactive youth group while making an opening address earlier said that Meles was not only a person who has already made history but added that his vision and legacy would have a lasting imprint on future generations. She quickly underscored” we the youth are fortunate enough to carry the torch as trail blazers to realize the great dream and vision of our beloved leader”. It is appropriate to declare at this occasion that we the youth are ever ready to partner with the Meles Foundation in order to realize his legacy”, she underlined Enlightening poems and eulogy of PM Meles presented during the event by invited guests and the youth illuminated the congregation. Cultural songs and variety shows of Traditional Coffee ceremony and a gourmet of Ethiopian cuisine added flavor to the night. Another spin of the night that left everybody mesmerized was the beautiful picture of the PM in his prime age which was put on auction and was immediately bought by one of the guests present by tabling thousands of dollars. 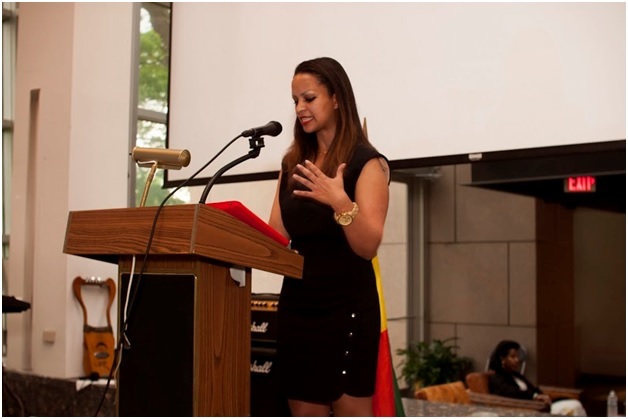 Recap of Saturday, May 11, 2013, the day of Meles Zenawi birthday celebration and a night of reflection at the auditorium of the chancery of Ethiopian of embassy in Washington, DC.